Are you tired of running out of checks, paying too much for replenishment checks from your bank or enduring the downtime it takes for the bank to send the checks to you? Ease your frustration with easy-to-use check design tools. 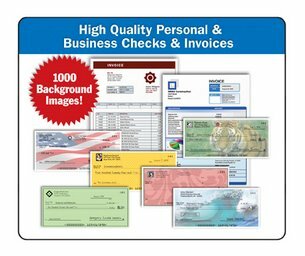 Checksoft Home & Business helps you easily create and print personal and business checks for multiple accounts, saves you up to 80% on check paper costs, and manages your finances from one place. IMPROVED! User Interface makes Checksoft Premier easier and more intuitive to use than ever. IMPROVED! 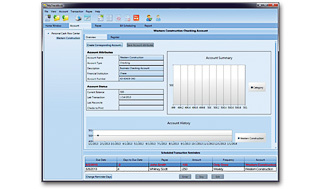 Account Set up Wizard makes it easier to create and set up an account so you can start designing your checks instantly. IMPROVED! Check Design Wizard – preview and select predesigned templates and insert or replace background images with ease. IMPROVED! 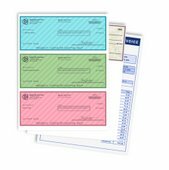 Check Design Tools - an enhanced interface and better design tools make it easier to customize your check design. Compatible with the latest versions of QuickBooks® and Quicken®. NEW! Live Update Technology ensures that you get the latest version of QuickBooks and Quicken compatibility free for one year. Manage your business and personal accounts in one place. Reconcile your statements. See your balances at a glance. Design and print personal and business checks. Choose from over 100 templates. Or customize your own. Streamline your check writing and printing with Check Designer. Now, up to 10 users can create and print checks concurrently using the same design file. 1 license included. Get started quickly. 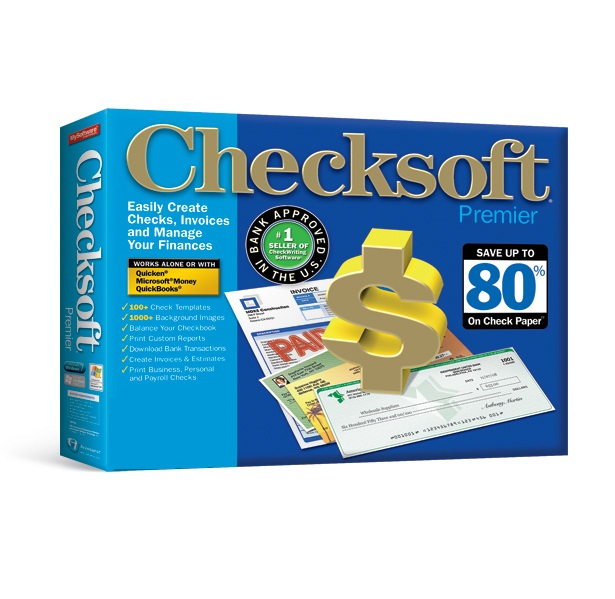 Checksoft works just like a checkbook, making it easier to enter and edit transactions. Monitor cash flow, track spending, schedule bills and print reports. With Checksoft Premier, you can easily print checks from Quicken®, QuickBooks® Basic & Pro, QuickBooks Premier, and Bookkeeper software. Analyze your business with easy-to-read reports. 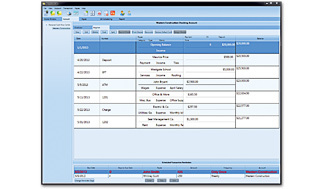 Generate a wide variety of reports including Payments, Checks Printed, Expenses, and much more. Customize your invoices and estimates with your customer information, calculate totals, taxes, shipping and discounts, and print with your company logo. Change estimates to invoices with one click. Charge interest to overdue invoices and send collection letters. Include PayPal® link in your email messages to customers. Simply obtain customer bank details via email, phone or fax, create check draft then print and deposit. No signature required! Stay on top of your bills and payments by scheduling them ahead of time. Bill Scheduler reminds you when your bills are due and automatically records them for you. As later versions of the software programs are released, please check with Avanquest for the latest software updates. *NPD Group/NPD Techworld January 2007 - December 2012. ***A MICR toner cartridge is not required to print valid checks from this software. 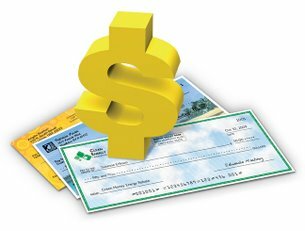 However, some financial institutions or retailers may require checks with MICR toner. If you have concerns, contact your financial institution and the retailers you patronize to inquire if MICR toner is required. 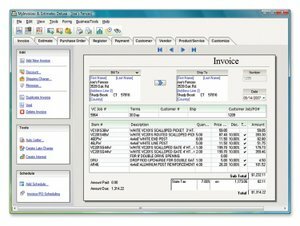 If you determine that MICR toner is required on your checks, please visit www.mysoftwareforms.com. †A QIF file format is required to import transaction data from Quicken, credit card companies or your bank. ††Bonus: 250 personal and business checks included in the box version only.